I mentioned previously that we came across an old stroboscope down at the 'varsity, and that we were looking for some worthwile use for it. The picture below is probably the best and most interesting one we've produced so far. It might not be entirely obvious at first, but this is in fact a demonstration of a rather funky consequence of the conservation of momentum. I you drop two objects from a height h, one of mass m and one of mass M, and where m<<M, such that m will land on top of M immediately after M hits the ground, m can in principle bounce to a height of several times h. 9h, in fact, if m=0, M>0, and no energy is lost to friction. At the left hand side, about halfway up the picture, one can see a pingpong ball, fastened on top of a golf ball with a minute amount of glue. There are several exposures of this, because I didn't manage to time it perfectly. Then, a little bit further down, one can see pingpong ball and the golf ball falling towards the ground, still glued together. At the bottom, still on the left hand side, the golfball has just hit the ground, and the pingpong ball has torn free of the glue. Proceeding to the right, one can see the pingpong ball bouncing to about 2.5h. So how do I know that 9h is the upper limit for the height the pingpong ball could bounce to? 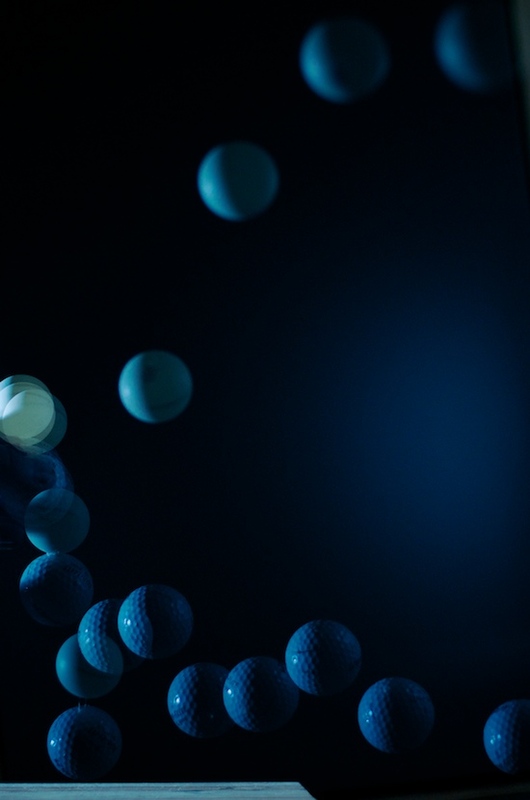 Just before the golf ball hits the ground, both objects are traveling downwards, with speed v. Immediately after the golf ball hits the ground, but before the pingpong ball hits the golf ball, the pingpong ball is still traveling downwards with speed v, whereas the golf ball is traveling upwards with the same speed, v. If we now consider this from the frame of reference of the golf ball, it is at rest, while the pingpong ball is moving downwards with speed 2v. Assuming that m=0, the pingpong ball will just bounce off the golf ball as if it was a wall. Hence, after the collision, it will be moving upwards with speed 2v (still in the frame of the golf ball). We now know that the pingpong ball is moving upwards with a speed of 2v in a frame that is itself moving upvards with speed v as compared to the lab frame. Hence, the speed of the pingpong ball in the lab frame is 3v. An increase in speed by a factor 3 means an increase in energy by a factor of 9. Thus, the pingpong ball could ideally bounce to a height of 9h. That is epic awesome. Physics, for the win! I'm not sure it's either epic or awsome, let alone both. I mean, it's not as if angelic hordes came forth and carried the pingpong ball to new heights, while raining fire and brimstone upon the golf ball. I thought it was rather neat. Yes they did, Tor. You just can't see it because your mind is closed by all that science stuff you do. But seriously, I have to agree with Mary. It's at least slightly epically awesome. 1. Pertaining to that species of poetical composition (see EPOS), represented typically by the Iliad and Odyssey, which celebrates in the form of a continuous narrative the achievements of one or more heroic personages of history or tradition. Epic dialect: that form of the Greek language in which the epic poems were written. 2. Such as is described in epic poetry; epic theatre, a play or plays characterized by realism and an absence of theatrical devices. 3. A story, or series of events, worthy to form the subject of an epic. While there is the slight possibility that Tor's toil in the interest of a joining of physics and photography in this instance could be the topic of an epic poem, I object on principle to this newfangled use of the word. Acknowledging that language changes does not mean blindly accepting all changes without commentary. Also, there is the technical possibility that Tor's mighty achievement has inspired Mary with a sense of awe in this particular case. He is, after all, rather wonderful. Sorry, Camilla, but physics as it stands is a series of events worthy to form the subject of an epic. It's also characterized by realism and an absence of theatrical devices. Tor's pursuit of an understanding of the universe is therefore part of this epic, and worthy of the use of the word. The awesomeness is a subjective value judgement. I feel the need to inform everyone about how much I have giggled reading the comments posted after mine.